Gas prices have risen sharply over recent weeks and are forecast to continue rising. According to Atlantagasprices.com, local gas prices have risen by almost thirty cents in the past month and by a dollar in the past year. 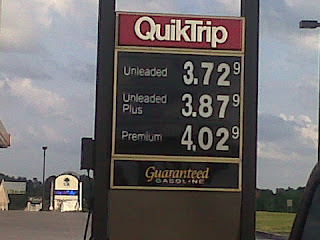 Atlanta’s gas prices are about nine cents cheaper than the national average, but have risen at the same rate. According to a forecast by the U.S. Energy Information Administration, gasoline prices could exceed four dollars per gallon this summer. To find out when the country will get relief from these high gas prices, it is first necessary to understand why they are rising in the first place. 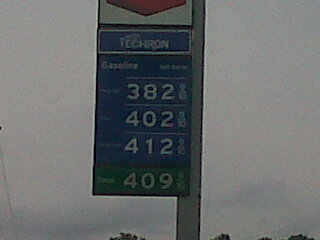 One reason that gasoline prices are higher is that it is almost summer. Refiners use a different recipe in summer months to create a “summer blend” gasoline. Cheaper additives used in winter tend to evaporate and cause pollution in the warmer summer months. Federal and local laws require different additives in summer to preserve air quality, but more expensive additives tend to drive up the price. Additionally, as refiners change blends shortages can result that drive up prices further. Federal law requires the sale of the summer blend from June 1 to September 15, but some local governments have their own timeline. To have the product in stations prior to June 1, production must start in March or April. One good thing about the switch is that is that most drivers will notice a slight increase in fuel economy when using summer blend gasoline. This is because there is more gasoline in the mixture and fewer total additives than in winter gasoline. The U.S.E.I.A. Short Term Energy and Summer Fuels Outlook (April 12, 2011) mentions two other factors in the rising price of gasoline and oil. First, one component of rising oil prices is due to growth in demand as the world and U.S. economies finally recover from the recession. Second, oil supplies are being reduced by the disruption of Libyan oil exports and the continuing unrest in the Middle East. Looking back through history, it is easy to see a pattern in which oil prices rise sharply and the economy subsequently plunges into a recession. These oil shocks have occurred several times in the past fifty years. The Arab oil embargo of 1973 led to the first oil shock and a major recession from 1973 to 1975. A second occurred in 1979 with the Iranian Islamic Revolution and was followed by the recession of 1980 to 1982. A smaller spike occurred in 1990 with the Iraqi invasion of Kuwait and another in 2001 after the 9/11 attacks. The most recent oil shock occurred in the summer of 2008. Oil shocks typically cause a decline in the demand for oil as prices rise, but they also cause a decline in the demand for other goods and services as well. The reason for this is two-fold. If consumers are spending more at the pump, they have less money to spend on other things. Second, the prices of other things are rising as well because oil and gasoline are used to manufacture and transport a large number of products. As demand falls off, companies earn less in sales and therefore produce less. The economy shrinks into a recession. This was illustrated in vivid detail in 2008 as the price of oil collapsed after the economy crashed. Conversely, the rising price of oil is an incentive for producers to produce more oil. Oil reserves that were not economical to tap at lower prices are suddenly more attractive. Other producers, such as OPEC countries, have historically ignored production quotas to take advantage of rising prices as well. The increase in the supply of available oil on the market drives the price down. Eventually, supply and demand reach an equilibrium at a lower price. The crisis in Libya has also helped to drive up oil prices around the world. Even though Libyan oil primarily supplied Europe, when Libyan production was lost European companies had to look elsewhere for oil to meet their needs, driving prices up. In the ongoing struggle, Libya is estimated to have lost two-thirds of its oil production. Prior to the war, Libya ranked 17th in world oil production with most of its exports going to Italy and Germany. The disruption is the eighth largest oil disruption in modern history. There is still more unrest in the Middle East as well. The “Arab Awakening” has spread from Tunisia and Egypt throughout the Arab world. The uprisings have not yet reached Saudi Arabia, the world’s largest oil producer, but Saudi forces have intervened militarily to support the ruling family in neighboring Bahrain. Unrest in more oil-producing countries would have a further upward pressure on the price of oil. As always, Iran’s nuclear ambitions also threaten the region. There are other factors in the price of oil that are not discussed in the Energy Information Administration’s brief. Chief among these is the Obama Administration’s moratorium on off-shore drilling. Originally, President Obama had announced a plan in March 2010 to allow drilling in the eastern Gulf of Mexico and parts of the Atlantic. After the BP oil spill, Obama reversed his decision and temporarily banned offshore drilling in waters deeper than 500 feet. He lifted the ban (which was struck down by the courts in its original form) in October, just prior to the midterm elections, and kept the ban on the eastern gulf and Atlantic. Even after the ban was lifted, the Administration dragged its feet on issuing drilling permits to the point where oil companies sued the Department of the Interior. Again, the courts found in favor of the oil companies and agreed that the new rules issued after the ban was lifted imposed an informal moratorium. The government continued its policy of delaying permits and was found in contempt by a U.S. district judge in February 2011. Ironically, while American oil companies are banned from drilling in the Gulf of Mexico, other countries are not. Cuba has sold drilling rights to more than a dozen countries including Russia, Sudan, Myanmar, and Vietnam. China is currently negotiating leases with Cuba that would allow drilling within 45 miles of Florida. Another government policy that has a negative effect on oil prices is quantitative easing. The Federal Reserve, led by Ben Bernanke, has been increasing the money supply by buying government bonds. As more money enters the market each dollar is worth less because price falls as supply increases. Each dollar will buy less because it has been devalued. This is called inflation. Bernanke does not believe that his inflationary policies affect the price of oil, but logic dictates that if each dollar used to purchase a barrel of oil is worth less then the oil producers will want more of them for their product. If a barrel of oil is sold for more dollars than before, the price of the gasoline it produces will also increase. Essentially, Bernanke agrees that inflation is likely, but doesn’t think it affects oil prices. One factor in oil prices that is likely not a major problem is speculation. In another flashback to 2008, President Obama is again demonizing commodities traders as speculators who are driving up the price of oil. A quick comparison of the current OPEC basket price for oil and recent futures prices for oil on the Chicago Mercantile Exchange. On April 25, the OPEC basket price was $119.38 per barrel. In contrast, the futures prices listed for the close of trading on April 26 are in the $112 to $113 range for the next year. It seems that traders are betting that the price of oil will actually decrease slightly from its current level rather than forcing the price up. Similarly, Oil-Price.net shows the current price of oil at $112.13 which is less than the basket price being charged by the oil-producing members of OPEC. There are several things that President Obama could do to help alleviate rising oil prices. The most obvious is increasing the supply of oil available to help keep prices down. In July 2008 President Bush lifted the presidential ban on offshore oil exploration and called on Congress to rescind a congressional ban. The effect was an immediate decrease in the price of oil even though new sites could not be drilled for years. A similar move by Obama could reverse the trend of rising oil prices and prepare new oil fields that will help relieve the American dependence on foreign oil. Unfortunately, Obama’s policy has been the opposite with bans on offshore drilling and a resistance to issuing new drilling permits. Second, President Obama could take steps to secure Middle Eastern oil fields. This might mean politically unpopular moves such as expanding the U.S. role in Libya to topple Gadhafi. If the U.S. and NATO intervene with ground troops to break the stalemate between Gadhafi and the rebel forces, Libyan oil production could recover to full capacity. President Obama is unlikely to commit more U.S. forces in what is already an unpopular war. This is especially true considering Obama’s anti-war base and Democratic criticism of the Iraq War as a “war for oil” as well as the president’s indecisiveness on military matters. Another option that could give consumers some relief would be to declare a gas tax holiday. In June 2008, Georgia Governor Sonny Perdue stopped a scheduled increase in the Georgia gas tax as prices approached record highs and suspended the gas tax entirely in the wake of Hurricane Katrina in 2006. The Georgia gas tax is automatically scheduled to increase on May 1. 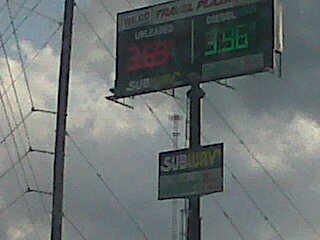 The increase is tied to rising gas prices. The new rate will be an increase of 2.8 cents to a total of 12.9 cents per gallon. The federal gas tax is even higher at 18.4 cents per gallon. By not collecting gas taxes, President Obama would cut the price of gasoline at the pump by almost twenty cents per gallon. The problem is that this is a temporary fix that would do nothing to address the problems of supply and demand that drove prices up in the first place. Many believe that a better course would be to enact broader tax reform for more permanent relief. In any case, President Obama is unlikely to push for a tax cut of any sort. If all else fails, Americans can still expect the price of oil to fall. As history has shown, the price of oil generally falls when the economy enters a recession. Oil at $100 per barrel might not be enough to cause a recession by itself, but in the current weakened economy it is far from the only negative factor. Worries over deficit spending, the negative effects of Obamacare, the possibility of rising taxes, and new regulations that are strangling business are all combining to slow the recovery. It seems increasingly likely that Obama’s policies and world events are combining to cause a double-dip recession that will ultimately at least give consumers some relief at the gas pump… if they still have jobs.